By John F. McKenna (McJack): Saturday nights fight at the MGM Grand in Las Vegas between WBO Welterweight champion Manny Pacquaio (54-3-2, 38 KO’s) and WBO/WBA lightweight champion Juan Manuel Marquez (53-6-1, 39 KO’s) was easily the most tactical of the three fight Trilogy between Pacquiao and Marquez. It was also by far the most frustrating for the Pacquiao team. Trainer Freddie Roach and strength and conditioning coach Alex Ariza had worked hard over the past couple of months to ensure victory for their fighter. Pacquaio himself began his training regimen early and worked harder than he had ever worked before in the preparation for any of his previous fights. It was brought to the attention to the media again and again how much Manny had evolved since the last time he fought Marquez in 2008. Pacquiao had grown from 130 pounds into a natural welterweight at 145 pounds. In addition Manny was a two armed fighter now whereas he had relied exclusively on his left hand in 2008. Pacquiao’s foot movement had also improved dramatically over the last 3 ½ years. In essence it was thought by almost everyone that Marquez had little chance against the new and improved Pacquiao who had morphed into a new fighter. The odds makers which initially favored Pacquiao over Marquez by 8 to 1 had risen to 10 to 1 by fight time. Marquez and his trainer Nacho Beristain however, were not buying the hype. They came with a game plan. Beristain knew that his fighter’s style would always give Pacquaio problems. The Marquez camp brought in their own strength and conditioning coach Angel Hernandez to help “El Dinamita” bulk up for the fight against the bigger Pacquiao. It was thought by bulking up Marquez would be better able to handle Pacquiao’s power shots. “Pacman” apparently believed the hype that he would easily steamroll over the now 38 year old Marquez. Even Freddie Roach and Alex Ariza had gone public in saying they thought that Manny might knock out Marquez in the 1st round. When things did not go as planned, by the middle rounds Pacquiao began to show his frustration. Marquez continued to hit Pacquiao with his laser straight left jabs and his accurate right hands. Manny seemed to have no defense for Marquez’s punches. Roach himself sensing the danger of Manny losing the fight exhorted him to “step it up”. Pacquiao responded by resorting to his throw caution to the wind attack style of fighting that had served him so well in the past. The words of the immortal Joe Louis ring true. Louis’s famous quote was that “Everybody has a plan until he gets hit. Manny got hit numerous times and changed his strategy. 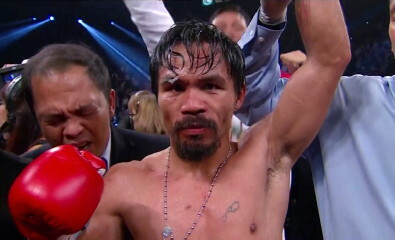 In an interview after the fight Roach said that he felt Pacquiao pulled the fight out in the final two rounds. Nacho Beristain for some inexplicable reason was telling Marquez in between rounds in the latter stages of the fight that he was well ahead. That advice may well have cost Marquez the fight. Manny by pressing the action in the final rounds may have as trainer Roach said pulled the fight out. Ringside judges, everything else being equal normally give close rounds to the aggressor. In Beristain’s defense, he may have feared a KO by Pacquiao if Marquez became too aggressive.